Poised to start the perfect date, a gentleman greets his lady with a heart balloon and a bouquet of flowers on the cover of this red card. 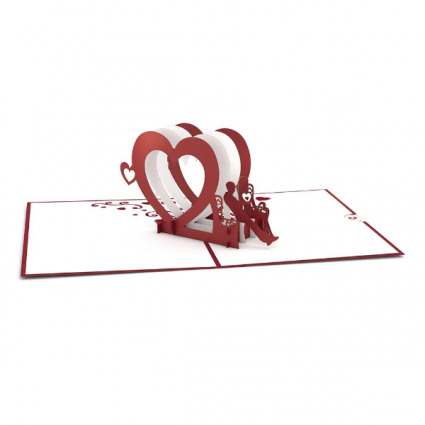 Upon opening the card, a romantic 3D heart bench pops to life giving the couple the perfect place to rest. This card makes it so easy to say I love you. Inspiration for the Heart Bench Pop-Up Valentine's Day Card: Every girl has a picture of a perfect date set in her mind. We wanted to bring a couple of those perfect date moments to life with this card. Who wouldn’t love to find a giant heart shaped bench while they are out on a date? Occasions for the 3D Pop-Up Heart Bench Valentine's Day Card: Our Heart Bench card is not only an excellent choice for the Valentine’s day, but it also serves as a great engagement card or anniversary gift. Use it to tell that special someone how much they mean to you on any day of the year. o happy together! 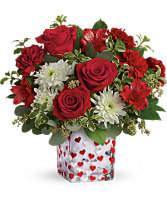 Celebrate your love and affection with this pretty bouquet of red roses and white mums, hand-arranged in a gorgeous glass cube that dances with red and silver hearts. Let her know your love is forever with a sensational surprise she’ll remember forever! We’ve hand-arranged 50 timeless roses in striking shades of red, pink and lavender inside a stylish cylinder vase for the ultimate romantic gesture. And because one amazing gift deserves another (and another…and another! 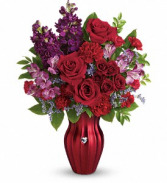 ), pair these gorgeous blooms with our huggable plush bear, decadent chocolates and “I Love You” balloons!